A supernova observed last year was so bright--about 100 times as luminous as a typical supernova--that it challenged the theoretical understanding of what causes supernovae. But Stan Woosley, professor of astronomy and astrophysics at the University of California, Santa Cruz, had an idea that he thought could account for it--an extremely massive star that undergoes repeated explosions. When Woosley and two colleages worked out the detailed calculations for their model, the results matched the observations of the supernova known as SN 2006gy, the brightest ever recorded. The researchers describe the model in a paper to be published in the November 15 issue of the journal Nature. Woosley's coauthors are Sergei Blinnikov, a visiting researcher at UCSC from the Institute of Theoretical and Experimental Physics in Moscow, and Alexander Heger of Los Alamos National Laboratory. "This was a stupendously bright supernova, and we think we have the leading model to explain it. It's a new mechanism for making a supernova, and for doing it again and again in the same star," Woosley said. "We usually think of a supernova as the death of a star, but in this case the same star can blow up half a dozen times." The first explosion throws off the star's outer shell and produces a not-very-bright supernova-like display. The second explosion puts another supernova's worth of energy into a second shell, which expands at high velocity until it collides with the first shell, producing an extraordinarily brilliant display. "The two shells collide out at a distance such that the full kinetic energy is converted into light, so it is up to 100 times more luminous than an ordinary supernova," Woosley said. "Usually a supernova only converts 1 percent of its kinetic energy into light, because it has to expand so much before the light can escape." This mechanism requires an extremely massive star, 90 to 130 times the mass of the Sun, he said. As a star this big nears the end of its life, the temperature in the core gets so hot that some of the energy from gamma-ray radiation converts into pairs of electrons and their anti-matter counterparts, positrons. The result is a phenomenon called "pair instability," in which conversion of radiation into electron-positron pairs causes the radiation pressure to drop, and the star begins to contract rapidly. "As the core contracts it goes deeper into instability until it collapses and begins to burn fuel explosively. 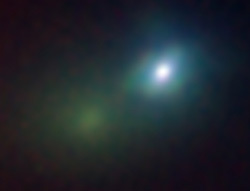 The star then expands violently, but not enough to disrupt the whole star," Woosley said. "For stars between 90 and 130 solar masses, you get pulses. It hits this instability, violently expands, then radiates and contracts until it gets hotter and hits the instability again. It keeps going until it loses enough mass to be stable again." Stars in this size range are very rare, especially in our own galaxy. But they may have been more common in the early universe. "Until recently, we would have said such stars don't exist. But any mechanism that could explain this event requires a very large mass," Woosley said. Other researchers had suggested pair instability as a possible mechanism for some supernovae, but the idea of repeated explosions--called "pulsational pair instability"--is new. According to Woosley, the new mechanism can yield a wide variety of explosions. "You could have anywhere from two to six explosions, and they could be weak or strong," he said. "A lot of variety is possible, and it gets even more complicated because what's left behind at the end is still about 40 solar masses, and it continues to evolve and eventually makes an iron core and collapses, so you can end up with a gamma-ray burst. The possibilities are very exciting." This work was performed by the Computational Astrophysics Consortium supported by the Scientific Discovery through Advanced Computing (SciDAC) Program through the U.S. Department of Energy offices ASCR, HEP, NP, and NNSA, and also by NASA and by the Russian Foundation for Basic Research and Science Schools. At Los Alamos, this work was carried out under the auspices of the National Nuclear Security Administration of the U.S. Department of Energy. Note to reporters: You may contact Woosley at (831) 459-2976 or woosley@ucolick.org.